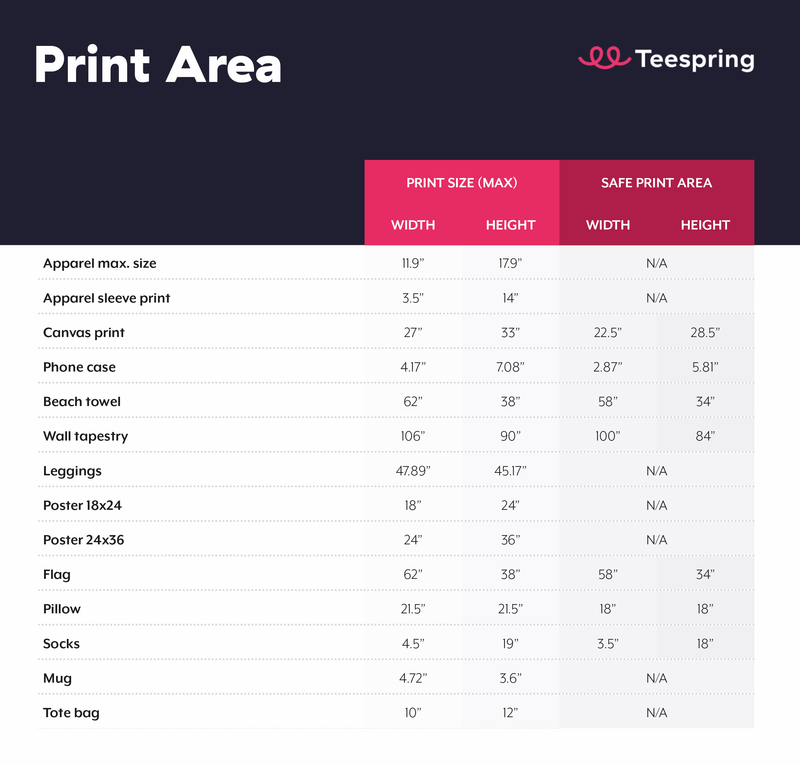 We want to help you as best we can, so this helpful guide will show you how to best set up your design files so you can launch your merch stress free. By using this guide, you should have no problems in preparing your artwork. Below we’ll share some tips to help you optimize your design files to ensure your artwork appears as best as possible on your products. We are happy to help with a variety of other services including file type compatibility, troubleshooting, and other problems caused by not having the proper software. So if you still have any questions or can’t get something to work simply reach out to campaigns@teespring.com and our support team will be more that happy to assist. It’s in your best interest to always use high-quality images. Lower quality images result in longer processing times and loss of fine details to your completed product. Very low quality images will be rejected. You must also outline the text if uploading an .EPS file. Image resolution: We recommend creating designs with the 300 DPI possible (dots per inch). The minimum DPI the launcher will accept is 120. File Types: PNG files are best but the launcher also accepts other types of image files. File size limit for the launcher is 50 MB. Color System: We use an RGB workflow. Our DTG machines print Red and Green, as well as the traditional CMYK, which allows for a larger color gamut. One common mistake is assuming that if your background in an image matches your shirt color, that it will not show up. This is not the case, so it’s crucial to delete any image backgrounds that you do not want as ink on the shirt. If creating a pixel-based design in software like Photoshop, use the pen tool to clearcut your designs or the magic wand if you have a strong contrasting background. Make sure you set your file to the print size you intend to upload before removing the background. There are a bunch of resources online and incredible tutorials on YouTube, such as these great videos by YouTuber Charley Pangus. If you need to get up and running quickly and don’t have design software, then we highly recommend checking out Canva, to create simple, clean designs using their easy to use online platform! You can have your idea turned into a print-ready file in no time! So you’ve got an idea, but you don’t feel like you have the time or skill to turn it into a reality… not to worry – we have handpicked a talented group of designers that we highly recommend working with. Check out our Teespring Trusted Designers HERE. They have been picked based on their experience working with creators and producing high quality artwork made for merch. Remember, if you have over 100k subscribers on YouTube then we offer a personal design support service. Send through your request HERE and a member of our design support team will be in touch within 24 hours.